Cincinnati/Northern Kentucky International Airport (CVG) is in the midst of a $6 million terminal modernisation project to upgrade its terminal and two concourses throughout the remainder of 2017 and early 2018. Candace McGraw, Chief Executive Officer of CVG, provides details of the renovation project, highlighting the importance of regional branding in making passengers feel welcome in Cincinnati. Construction has been divided into six phases with emphasis placed on minimising disruption to passengers. Internally, a floor-to-ceiling makeover is taking place in the baggage claim area that includes more energy-efficient lighting, new carpet and wall treatments. The ground transportation centre is also being renovated, with new carpet installed in the walking tunnel connecting the terminal and concourses. Externally, the CVG curb front will benefit from brighter lighting and simplified signage for better wayfinding. Elsewhere, upgrades will be made to parking vestibules and the parking garage tunnel, and new carpet will be installed in the terminal ticketing level as well as Concourses A and B. The upgrades build on the sense of place – essentially, a feeling of locality – that is currently evident in CVG’s terminal and concourses. The aim is for passengers to feel welcomed home or welcomed to Cincinnati/Northern Kentucky, by incorporating regional branding elements. Greater Cincinnati is currently undergoing its own branding positioning with a view to defining exactly what the region stands for. Leading the effort is Source Cincinnati1, an organisation created to amplify the ‘Cincinnati story’ to national media. CVG recognised the role they could play in promoting this story, as the airport is effectively the front door to the community. Airports play a vital role in establishing a sense of place from the moment a passenger steps off the airplane. When planning its terminal modernisation project, CVG worked closely with the Atlanta architecture firm PGAL, which specialises in aviation design, to execute the design and construction administration for the project. PGAL drafted interior concepts, drawing inspiration from both Kentucky and Ohio given that the airport is located just 15 minutes across the Ohio River in Covington, Kentucky. Specific visions included Kentucky bluegrass, the Ohio riverfront, rolling hills, horses, bourbon, music, technology, Midwestern charm and connectivity. Interpretations include natural materials, wood, stone and texture. The concepts included colour schemes that represent the area, including greys, whites and ‘Roebling Bridge blue’ that carried through into new carpet, paint and lighting. The focus was on brightening and simplifying the overall baggage claim area with light tones. Architectural wall and ceiling structures for the project were positioned in baggage claim that replicate the Roebling Bridge and its connectivity between Ohio and Kentucky. The structures that had been created especially for the project connect the north and south walls in baggage claim. A wood panel wall inspired by bourbon barrels – Kentucky’s signature spirit – will feature in baggage claim, with its east and west walls covered in a Luxury Vinyl Tile (LVT) plank. Typically used as a flooring material, a special, thinner and lighter version of the LVT will be installed in a running plank. Photographs from around the region already adorn parts of CVG’s terminal and Concourse A, including Cincinnati’s Union Terminal, Findlay Market, Fountain Square, Turfway Horse Park and others. 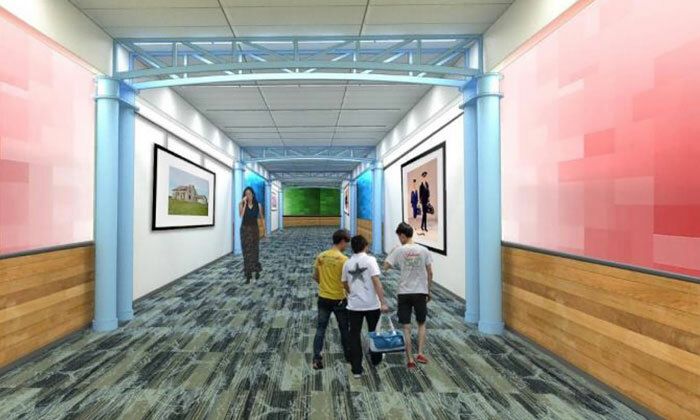 Similarly, large-scale photographs will be incorporated in the baggage claim area that represent a shared vision and common flow connecting CVG’s brand with its upcoming consolidated rental car facility. This is due for completion in 2021 and will also be designed by PGAL. 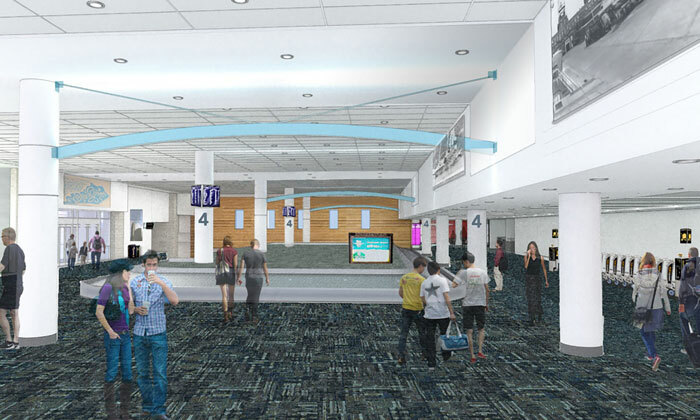 The existing suspended acoustical ceiling tiles and grid are being replaced with a newer, lighter ceiling tile system that offers better noise reduction to the often-crowded baggage claim arena. New, modern energy-efficient linear LED light fixtures will graze the surface of the new ceiling, brightening the entire baggage claim area while providing significant energy savings for the airport. Signage in the parking garage lobbies are also getting an overhaul as part of the terminal modernisation project. Maintaining a clear visual language is critical to the efficient operation of an airport. The new parking garage lobby signage brightens and lightens the existing colours, while incorporating a brand-new graphic style that is compatible with the airport’s existing signage. The parking garage lobbies will receive new lighting and paint consistent with the interiors throughout the rest of the baggage claim, as well as resilient weather-resistant flooring designed to withstand the large volumes of traffic to and from the terminal during peak hours. When the project is complete, travellers through CVG will be able to experience Greater Cincinnati’s rich culture, heritage and Midwestern charm all within airport walls. Candace S. McGraw was appointed Chief Executive Officer of the Cincinnati/Northern Kentucky International Airport (CVG) in July 2011. Since joining CVG, she has focused on positioning the airport for the future by completing a 2035 Master Plan Study; consolidating operations into a renovated terminal facility; diversifying revenues through targeted cargo, land and concessions improvements; finalising a modernised Use Agreement; and increasing carrier options. Candace is active in the local community as well as the aviation industry. 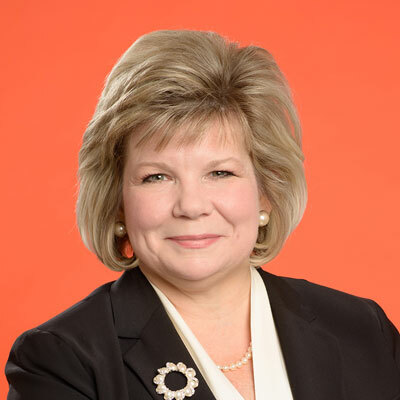 She is currently the Chair of Airports Council International-North America (ACI-NA); serves on the Audit Committee of the Airports Council International World Board; and has earned the International Airport Professional (IAP) designation.